“As Defenders of the robot nation, Team 1675 continues to do everything in its power to spread the message of FIRST and create new heroes through science and technology.”–Team 1675 Mission Statement. 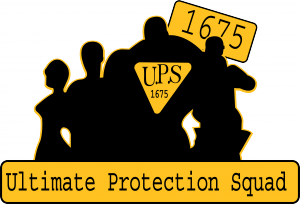 Team 1675, the Ultimate Protection Squad, is a partnership between many high schools, including Bradley Tech, in and beyond the Milwaukee region. This partnership brings together some of the best minds and equipment in the country. Since 2005 the schools, along with their engineering and community sponsors, have worked towards a common goal of creating a stable and organized FIRST robotics team. Team 1675 are regional champs! At St. Louis, March 9, 2016. Building this team has been very similar to building a robot, requiring many components to function together as one. Students operate Team 1675 while mentors assist and the team continues to help other teams and the community in many ways. By helping students in the FIRST LEGO League and providing opportunities with the Vex Robotics System, team members prepare younger students for the rigors of a FIRST Robotics Competition team, which ensures that the team will continue to thrive for years to come. Visit the Team 1675 website. WTMJ: Team shows off robots. Milwaukeenns: Robotics team ahead of competition. 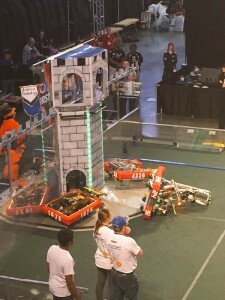 MPS press release: Team 1675 kickss off new season. 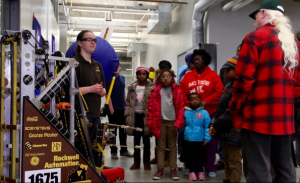 Robotics Team 1675 displayed and demonstrated its projects during a recent open house.